Justin Akol (pictured below) lives in Asinge village, Kumi district, in Uganda. Like most of us, he has many responsibilities. He is a father of nine children, a husband and an orange farmer. Justin also works as a Village Health Team (VHT) member (each VHT serves as the primary health contact for a community in Uganda). In a recent interview, Justin shared his experiences and his motivation working for WellShare International. 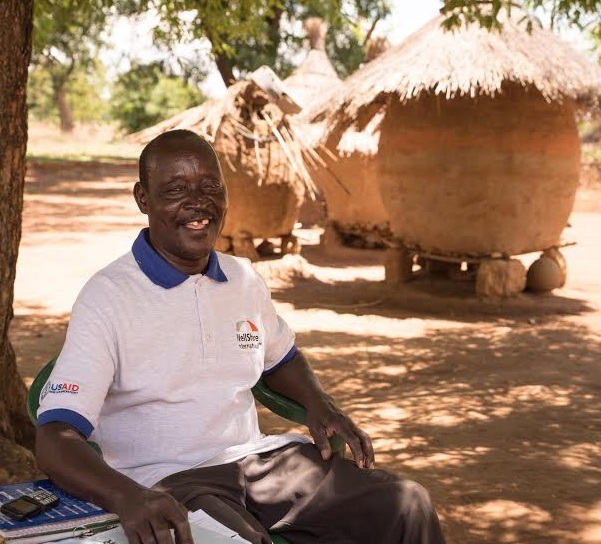 Justin felt very honored when he was elected as a VHT in 2002 and now that he has received training in Community Based Family Planning from WellShare, he is able to support his community and to change lives, even beyond his village borders. Justin counsels families in family planning methods and administers suitable drugs to clients. He also works on malaria prevention and treats patients that suffer from malaria infections. Justin is very proud of his work. Since he started giving malaria treatments, no children in his village have died from the infection. “When you give the child the treatment, they become well,” said Justin. “I have been saving the children from Malaria.” These victories give him confidence and motivation. He can see that people are listening and responding to his advice, even carrying his word across the village borders. But his job is not easy. Justin’s passion in helping other people frequently takes him on long journeys. He often has to walk many miles to reach his clients. This is the most difficult part of his job. He wants to check up on all of his patients, but using only his feet, he often struggles to reach all of them, especially the ones that live farther away in other villages. There are other challenges as well. At the moment, the villages are facing a famine caused by prolonged drought. Food is scarce and Justin’s work is more important than ever. Justin himself has lost almost half of his crop because of this drought, yet he still remains hopeful. He thanks God for the work he can do to serve his clients. He knows that, because of his efforts, people understand how they can use family planning methods in order to protect their families, especially in times of food insecurity. Justin hopes that WellShare can train other member of his community as well. When he was little, Justin dreamed of being “a big man, serving people in the community.” Even if he could choose any job in the world, he would not want to change a thing. He is so happy and proud to be working with WellShare International that he named his last son “WellShare. This publication was produced by WellShare International, APC-GM-0041, through Advancing Partners & Communities (APC), a five-year cooperative agreement funded by the U.S. Agency for International Development under Agreement No. AID-OAA-A-12-00047, beginning October 1, 2012.